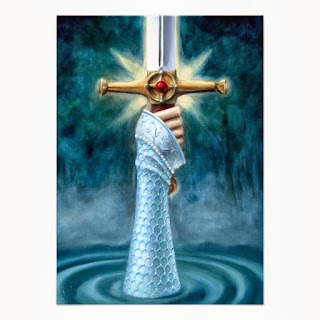 King Arthur and his sword Excalibur are two halves of a whole. One can’t read about one without the other in any Arthurian saga, whether it is Tennyson’s Idylls of the King (1885) or T.H. White’s The Once and Future King. Hollywood has played the sword in various forms, from 1953’s fantastical Knights of the Round Table to the most recent 2007’s historical play in the The Last Legion. 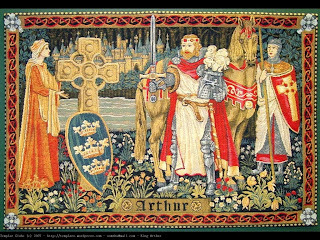 In between, Arthur and his mystical sword have appeared in numerous big screen, television, and direct-to-video productions including Excalibur, King Arthur, Lancelot of the Lake, the Mists of Avalon, Camelot, Monty Python and the Holy Grail, Merlin, Sword of Lancelot, Sword of the Valiant: the Legend of Sir Gawain and the Green Man, Prince Valiant (multiple versions), The Book of Merlin, First Knight, Merlin and the War of the Dragons, Merlin and the Book of Beasts, Merlin’s Apprentice, and Pendragon: Sword of His Father. We are obsessed with the legendary King and his shiny metal blade. The story of how Arthur comes to carry Excalibur depends on the teller. Two versions have been told over the centuries. The first deals with the sword in the stone. Legend has Arthur in London at a meeting of warlords with his foster father, Sir Ector and Ector’s son, Sir Kay. Arthur was squire to Sir Kay (Cai). Just before Kay was to enter the lists for his turn, Kay realizes his sword is missing. He sends Arthur back to their camp to retrieve it. Arthur can’t find the weapon, so he panics and tries to find a replacement. Arthur comes across Excalibur, secure within the stone. The young man pulls the sword out of the stone and takes it to Kay. After a bit of initial confusion, Arthur replaces the sword, watches other full knights fail to draw it back out, and then he easily pulls the blade out to prove he is the rightful King of England. The sword was said to be able to slice through any object, its power was that great. The scabbard had magic of its own, protecting Arthur from any injuries – provided the King wore the carrier on his belt. The historian, Geoffrey of Monmouth attempted to interject as many facts as fantasy in his history of the Kings of the Britons. Geoffrey found this information in a set of Welsh tales written in prose called Culhwch and Olwen. Depending on the version, Arthur’s relative (half-sister or cousin) Morgan Le Fay managed to get Excalibur from him. The King was able to acquire it back again, only the scabbard was missing. Without the powers of the scabbard, Arthur was vulnerable. When the war between Arthur and Mordred broke out, the King and his son (or nephew, again according to version) gave one another fatal wounds. Arthur ordered either Sir Griflet (in the Vulgate Mort Artu or Sir Bedivere in Le Morte d’Arthur) to throw the sword back in the water. Regardless of which story, the knights failed twice, returning to the King before making a successful third throw. "Now see I by thine eyes that this is done. Speak out: what is it thou hast heard, or seen?" Arthur did allow Excalibur to be used by his Knights. Percival, his nephew, carried Excalibur on his Grail quest. 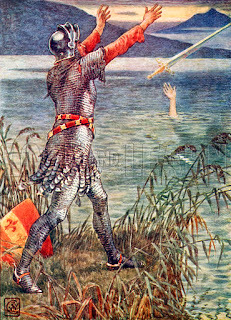 In Chrétien de Troyes’ French romance, Percival, the nephew of Arthur is given Excalibur to use in his search for the Holy Grail. Modern writers have spun many stories of King Arthur and the origins of his famous sword. 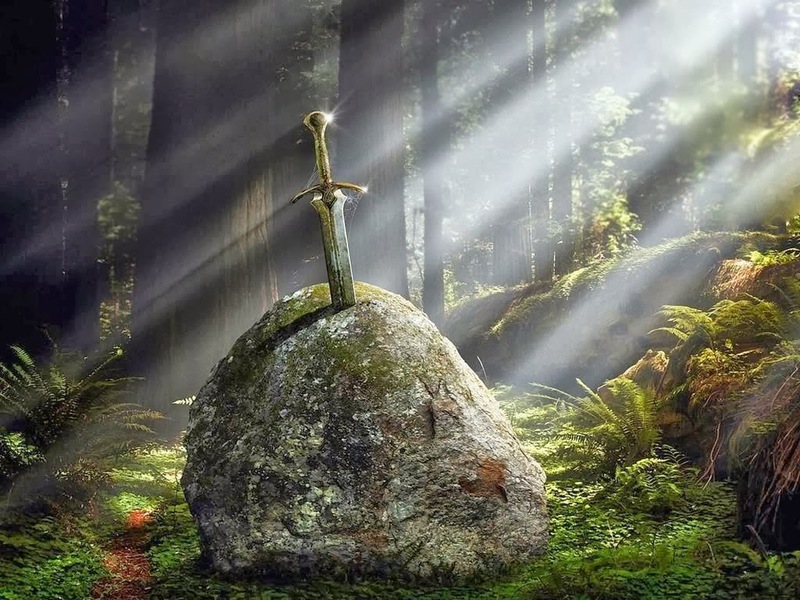 What made Excalibur so powerful? None of the early stories relate who made the sword but modern writers make various claims. One such story has Excalibur forged from material from a meteor while others have the sword made by extraterrestrial beings. Other authors have Excalibur’s origins in the land of the Fae or Dwarves. One thing is certain, if the legend is based on a change in weapon making, where the Chinese people found a way to improve metallurgy. Wootz steel was being manufactured in the 4th Century. Damascus steel weapons started being forged in the Middle East using Wootz steel about the same time. The best swords in the 9th century were Ulfberht swords, made in Scandinavia. These elite weapons were thought to have been made with a higher amount of carbon, which allowed the weapon to be more flexible. Consider that Arthur supposedly lived about this time period; it is possible the sword Excalibur could have been an Ulfberht sword which were carried by the leaders and high-ranking members of the Viking society. Arthur bade Sir Bedivere to take him to the shore of the lake, where a boat waited for him. There three women, Priestesses or Queens, took the King to Avalon. It is said Arthur rests, waiting for the day when He will be recalled back to England. I’m sure he will carry Excalibur at his side.